Entering the Self-Storage Market: Should You Buy an Existing Facility or Build One? SBA Financing and Self-Storage: Can a Small Business Loan Work for You? Individual sessions are also available as on-demand video. 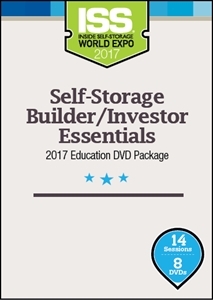 In DVD format, these sessions are also included as part of the Total Self-Storage Solutions 2017 Education DVD Package.